LSI is based on a world view of communicative self-steering. Reality as we experience it in an organisation or community consists of facts, possibilities and purposes. 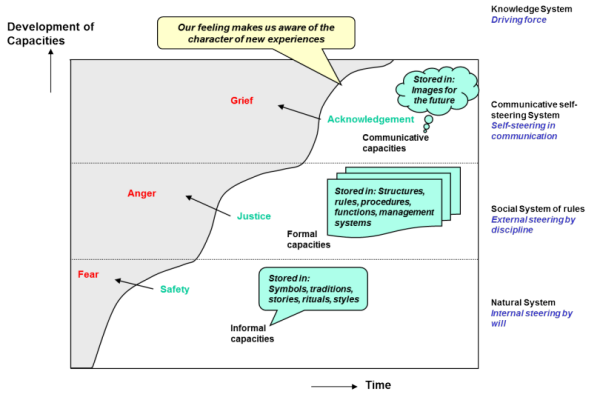 The logic of courage, discipline and communication (based on the logic of feeling of Arnold Cornelis) offers an adequate theoretical framework for LSI. The starting point of the model is that reality as we experience it in our communities, is layered due to simultaneous operation of steering mechanisms. Each layer (called a system) has its own characteristics and represents part of the organisation or community. Our feeling is crucial to determining in which system is at play when a problem or issue arises. For further explanation see the illustration below and read the explanation (pdf 639 kb).